No matter how well you think you’ve prepared yourself to be a parent or how many boxes of diapers you stocked up on before your baby’s arrival, you’re likely never going to have everything just right. And for those times when you would rather stay at home with your infant than run out for an emergency pack of diapers, finding the best places to buy diapers online comes in handy. Of course, if it’s a dire emergency, then a trip ones of the closest grocery stores might be necessary, but if you can get into the habit of buying diapers in bulk from one of these websites, or doing one of these diaper subscription services, it might make the whole parental preparedness situation a little easier. Unfortunately, these websites for buying diapers online aren’t all part of subscription services, so you’ll have to remember when to restock, but being able to do it all from the comfort of your home, well ahead of time, will definitely help you in the near future in case you run out of the box of newborn diapers you were sure was going to last more than three days. Finding the right diaper brand itself is up to you, but these are some of the best places to buy diapers online (for the lowest prices) and that’s half the battle. Since a lot of people in general already subscribe to enough automated services on Amazon anyway, it would make sense that they offer the ability to have diapers delivered as they’re needed. With Diapers.com now on Amazon, you can either order one-time purchases of any diapers you might need or save 5% by subscribing with your Prime membership. Amazon also offers the Dash button for diaper services, but with the Diapers.com partnership, you can still find the bulk quality diapers you need by ordering online rather than going in the store. Subscribe and Save: You can either purchase individual packs or boxes of diapers each time or sign up for a subscription, but you aren’t obligated to do either. Shipping: If you choose to buy individual boxes of diapers, the shipping costs will vary, but since the subscription entails having a Prime membership, members do get free two-day shipping in most cases. The Best Part: You can really get the most out of Diapers.com’s partnership with Amazon if you have an Amazon Prime account. Price: A 144-count box of Pampers is $35 and 5% less with a subscription. While you can definitely buy any brand of diapers of your choice on Target.com, Target’s baby subscription makes it a lot easier to stay on top of purchasing diapers and ordering them even before you need them. As with most subscription services, the more dedicated you are, the more you’ll save. With Target, you can save 5% on every purchase and then another 5% if you use your Target REDcard to make the purchases. You can make up your own schedule to have diapers ship to your home without needing to go into your account to set reminders and to be on top of your diaper needs well in advance. There are also a variety of brands, including Target’s own Up & Up store brand to give you a full range of options. Subscribe and Save: If you sign up for Target’s diaper subscription, you’ll automatically save 5% on your orders each time, which can definitely add up for parents with newborns going through at least a dozen diapers per day. Shipping: The subscription service has free shipping for each order. The Best Part: You can save an additional 5% per order when you use your Target REDcard. Price: A 176-count box of Target’s Up & Up diapers is $22. Amazon offers a variety of its Dash buttons for so many different products that different families use often enough to warrant a button to reorder when they run out. In some cases, it’s laundry detergent, in other cases toilet paper or paper towels. So it should come as no surprise that Amazon also offers the Dash button for diapers. Both Pampers and Luvs diapers are available as Amazon Dash buttons, which can be placed wherever it’s most convenient in your home. The buttons are wifi connected and, when you’re running low on diapers, you can press the button to be automatically charged via your Amazon Prime account and your new order is placed immediately. Subscription: While Amazon does offer diaper subscription services, the Dash button is simply another way to order diapers quick and easily. Shipping: Since Amazon Dash buttons can only be used by Prime customers, the usual free shipping also applies. The Best Part: It might make buying diapers online as easy and simple as possible for pretty much anyone. Price: The actual Dash buttons are $5, and depending on which diapers you buy from there, the cost will vary. Purchasing diapers from BuyBuyBaby.com doesn’t involve subscribing to a prolonged subscription or even signing up at all, but the selection on the site is hard to beat. If you’re looking to simply buy diapers online when you want to and nothing more or less, then looking on Buy Buy Baby’s website will usually do it for you. The store itself is full of baby and toddler supplies and that kind of inventory carries over to the website, which is good especially for finding bulk boxes of diapers in different sizes and brands. Subscription: No subscription is necessary or offered to buy diapers on BuyBuyBaby.com. Shipping: On the website, there is always free shipping on orders more $49. The Best Part: Since you’ll likely be buying large quantities of diapers anyway, the free shipping on orders over $49 will likely come in handy. Price: The prices vary, but for a 216-count box of Pampers, it’s $46. The biggest aspect of what Boxed.com offers is wholesale products for those which people tend to want to buy in bulk anyway, diapers included. Depending on what brand and even product you choose, there will be a certain amount of money saved and really, anything is welcome when you’re going through diapers as often as parents tend to do. In some cases, you might save 16% off the in-store price, and other brands might have you saving 37% off retail prices. Either way, you’re going to be saving something when it comes to diapers at Boxed.com. Subscription: There are no subscription or membership fees necessary with Boxed.com. Shipping: You’ll get free shipping on your first order and after that, on any and all orders over $49. The Best Part: For every box of diapers (and anything else) you purchase, you can earn back 1% in cash rewards. Price: For a 128-count box of Luvs, it’s $26. DiaperBuys.com is an online source for pretty much any kind of diaper you might need and for any age and size, which runs pretty far and wide. This is especially useful for new parents getting used to not only buying diapers but finding it difficult to gauge how many diapers to buy before their baby even arrives. Even though there are great deals and benefits by way of free shipping and recurring orders being cheaper, you don’t need to sign up for anything in order to shop on DiaperBuys.com and you’re really only making a commitment if you schedule to have recurring shipments. And even then, you’ll be saving on your overall purchases. 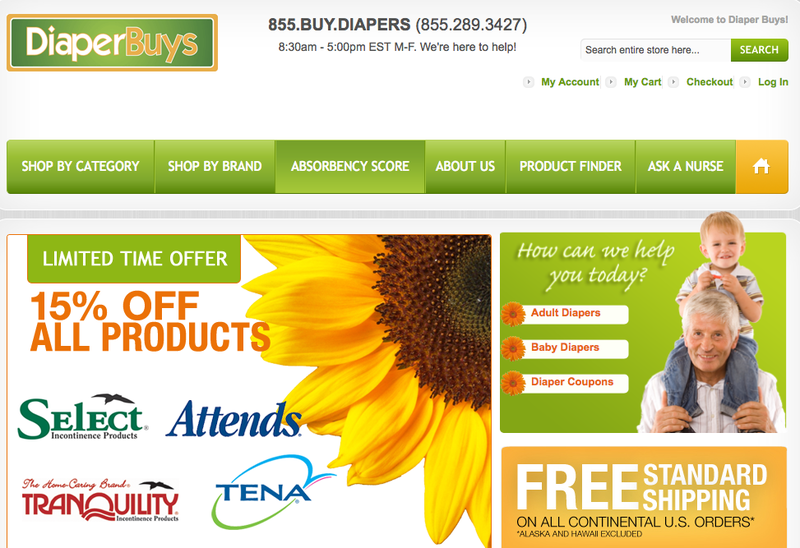 Subscription: There’s no need to sign up for anything with DiaperBuys.com. Shipping: The site offers free shipping on any order within the U.S., except for Alaska and Hawaii. 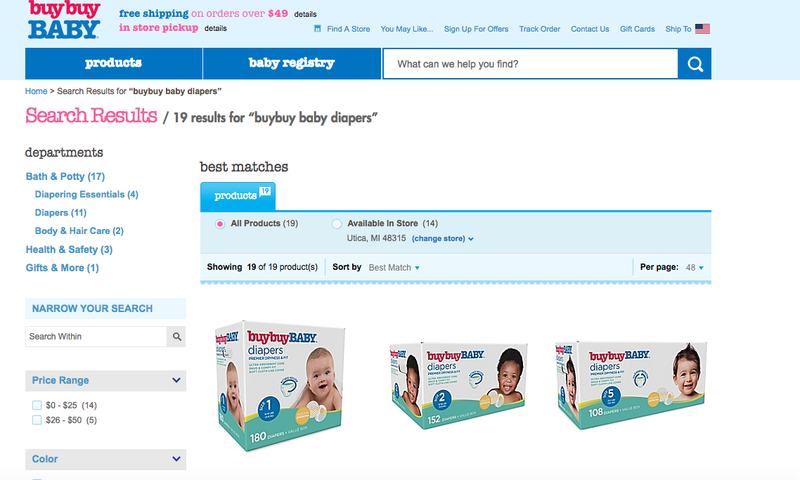 The Best Part: When searching for diapers on DiaperBuys.com, you can easily narrow it down by category, brand, and even absorbency level. Price: For a 112-pack of Huggies Little Movers it’s $45, including a 5% discount for getting on a recurring shipment schedule for however long or short you need to. For most, it’s probably to be expected that Walmart.com would have a large selection of disposable diapers since the store itself sells diapers in a wide range of brands, sizes, and quantities. But if you can’t make it to the physical store, or would rather steer clear of long lines and harassed cashiers, ordering diapers on Walmart.com will give you just as many good deals and just as often. Getting free shipping thrown in there certainly sweetens the deal and because there’s two-day shipping available for most diaper purchases on Walmart.com, it isn’t too hard to stay on top of your diaper needs. Subscription: There’s no diaper ordering subscription offered by Walmart.com. Shipping: It’s free to pick up your diaper purchase in-store, often on the same day, or you can get free two-day shipping to your home. The Best Part: You still get the same Walmart diaper deals, but from the comfort of your own home. Price: Looking for Huggies or Pampers? For a 216-count box of Pampers Swaddlers, it’s $36 on Walmart.com. A box is 132 Huggies Snug Dry cost $24.27,– it’s four super absorbent layers might be an extra plus. When it comes to organic diapering, some of the retailers above offer SOME selection, but in general the prices are not as reliable. ThriveMarket.com: If you haven’t heard of it yet, Thrive Market is an AMAZING online retailer for all things organic and specialty. Think of it like your neighborhood health food store, but online AND at extremely competitive pricing. You can specifically check out their diaper selection here. GetDyper.com: If you are specifically looking for BAMBOO diapers, GetDyper.com is a great pick for subscription service. It’s at least worth checking out here. Where can you find coupons for diapers? You can find coupons online for many different diaper brands, but a lot of the time Amazon, or any of the online stores that we previously mentioned, offer much better sales and savings. Are cloth diapers really cheaper than disposable? If you are interested in learning more about cloth diapers, for cost reasons, or if you are looking for eco-friendly diapers, I recommend reading my full guide on the Best Cloth Baby Diapers. When it comes down to it, finding the best online store or warehouse to buy diapers from on a regular basis is probably going to be a better deal in the long run. Not only that, but it also keeps you on top of your baby’s diaper needs, so you can spend less time running out and grabbing more packs of diapers and more time enjoying those few hours of quiet during nap time. Once you decide if you would rather buy diapers online on your own or rely on a subscription service, it will become like second nature. And before you know it, you’ll be on to the potty training phase.